This is the only complete and undamaged Cumberland point found on the Trinity Cumberland cache site. 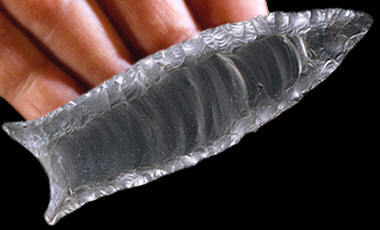 It's made of Wyandotte chert and measures 3 1/2 inches (8.9 cm) long and 1 1/8 inches (2.8 cm) wide. The Trinity site was discovered by Dave McCall and named after the town of Trinity, in Lewis County, northern Kentucky. The site is located about a mile southwest of town and situated on an ancient river terrace about 40 to 50 feet above the Ohio river flats. The Trinity site cache is the only documented Cumberland point cache found to date. 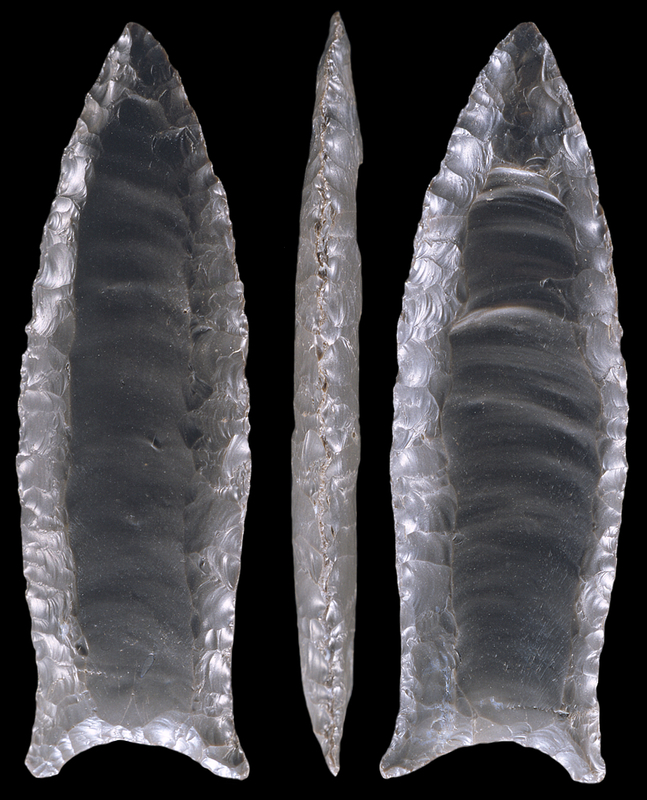 Most of the Cumberland points found on the Trinity site were found within a small area. There have been eleven Cumberland points found to date. They include, the undamaged point illustrated here, seven points assembled from fragments that represent complete & almost complete points and three more points that are represented by fragments of bases & points. This picture shows three views of the only complete unbroken Cumberland point found on the Trinity Cumberland cache site in Lewis County, Kentucky.